When you work in an industrial environment, if you can save a little bit of energy and time, it makes your job so much easier. 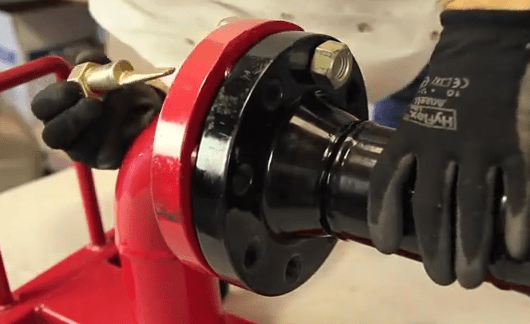 Flange connectors are one part of necessary work at an industrial-based company that often require multiple tools and extra time for what should be a simple job. Flanges are the linkages used to connect a piping network. This type of system is used in many industries such as petrochemical plants, refineries, midstream pipeline operations, power plants, and water utilities. Once the bolts are removed from the companion flanges, miss-alignment can occur–most often during routine maintenance. The tried-and-true method of aligning flanges requires the use of hand tools such as hammers and drift pins or fighting the flanges into alignment with a spud wrench. This can take a lot of time and labor, which makes a worker’s job much more difficult and can potentially cause injury. However, there is another method. Flange alignment pins eliminate the need for hammering and unsafe practices and align flanges in seconds. How Do You Use a Flange Alignment Pin? Flange alignment pins are incredibly easy to use. Find a pair of bolt holes that are closely aligned, slip your first pin all the way through, and turn it 180 degrees. Next, insert another pin into the bolt hole on the opposite side, and turn it 180 degrees. That’s it–no hammering or hand tools are needed, and now the flanges are completely aligned. Truly, the best part of using flange alignment pins is when you want to remove them, you just turn them another 180 degrees and pull them out with your fingers. Each pin is designed with a tapered shaft, rendering these pins the perfect flange alignment tools. Because of the tapered shaft design of the pin, this compensates for flanges that have up and down movement, and also flanges that have rotational misalignment. Flange alignment jobs such as these are typically a headache, requiring a lot of tools and labor. The simple design of the pin accounts for all types of flange alignments. It saves you time and money from not having to purchase additional tools for securing flanges. Flange alignment pins come in sets, or can be purchased separately and are available in different sizes. If you have many flanges that need to be aligned on a regular basis, purchasing pins individually may be your best and most convenient option. If a majority of your flanges are the same size, simply measure the bolt-hole diameter and pick the corresponding size flange alignment pins. Flange alignment pins are available in sizes ranging from 3/8” to 3 5/8 inches. Specialty Maintenance Products (SMP) is a leader in the best practices for flange alignment pins and other tools. Contact SMP today to find out how flange alignment pins can better streamline your business. Not only do we provide you with the tools, but we also give your company ample support and instruction on how to properly use them. All sizes of pins are in stock or ship in one day. For a fast delivery and prompt response to all of your specialty tool questions, you can rely on SMP Tools. Orders can be shipped up to 5:30 PM Central time.